Unable to Subscribe to Podcasts in iTunes store – Greyed Out Buttons? 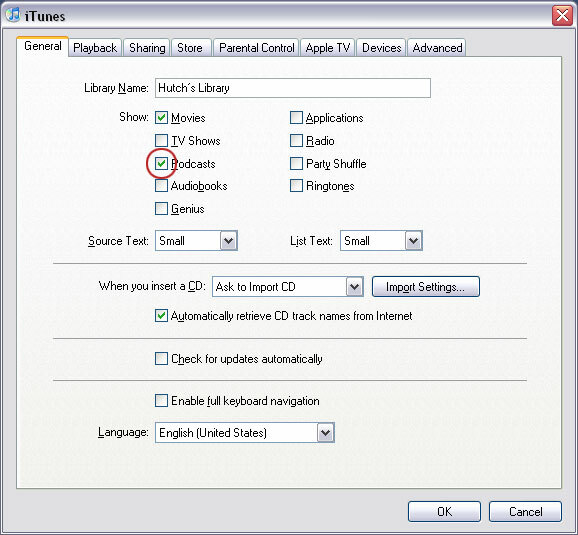 Open the iTunes Preferences. To do this, either press ‘Ctrl+,’ (that’s the control key, and the comma key at the same time); or Go to ‘Edit’ in the top menu, and then ‘Preferences’. Select the ‘General’ tab, usually on the left most. Once you say ‘Ok’ to the Preferences box, the ‘Podcasts’ item should appear in the top-left-hand side of the iTunes window. If you now view links to podcasts in the iTunes Store, they should be clickable. If you have any corrections or alternative solutions to this problem, please leave a comment! Please let me know if this post was useful with a click! Author benPosted on December 28, 2008 Categories iTunes1 Comment on Unable to Subscribe to Podcasts in iTunes store – Greyed Out Buttons?